One could reasonably say that many countries of the Middle East, especially, Iran, Turkey and Saudi Arabia, have recently been enjoying a period of political and economic peace and tranquility. It can also be said that these states have enjoyed a reasonably good relationship with the United States of America, at a time when the price of oil price has been rising. During the years of 1979, 1980 and 2003, several remarkable events have brought changes in the socio-political culture of the Middle East that has had lasting effects in world affairs. Let me briefly outline these historic events. On February 11, 1979 the Shah of Iran was removed from his seat of power and the Shiite sector of that society seized power in the country and established the first Shiite Islamic Republic of Iran. The formation of Al-Qaeda was a product of the Afghan – Soviet war (December 22, 1980 to February 15, 1989). The eight-year war between Baathist Iraq and Khamenei’s Iran (September 22, 1980 to August 20, 1988), ignited the old war between the Shiites and the Sunnis in the region. The Second Gulf War strengthened Iran as well as the Shiite power base in the region, and served to rekindle the war between the Shiites and Sunnis. The invasion of the United States in 2003 resulted in formation of the Islamic State of Iraq and Syria (ISIS) (primarily by displaced Baathists) with the aim to target the Shiite power base and with the explicit goal to establish a Caliphate. 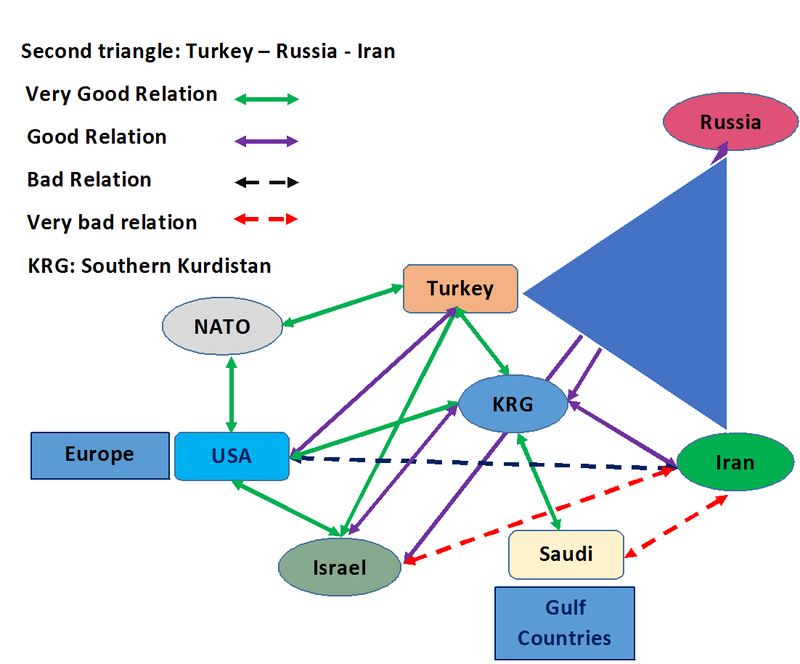 The diagrams below reflect the changes that these events brought about and portray their political effects in the region. The above diagram is intended to portray the fact that the balance of power depends on the good relations of the triad nations of the United States, Saudi Arabia, and Turkey. This triad’s purpose is to contain Iran and prohibit her undue influence on Iraq, Syria and Lebanon, and the rest of the Gulf countries. A rift in the coalition appeared after the failed coup attempt in Turkey, and the Turks have complained about the United States’ influence and the pressure of Russia after Turkey shot down the Russian military aircraft. The United States had been blamed for the advance of YPG, the Kurdish fighters in Syria, all of which is regarded as a huge threat to Turkey. 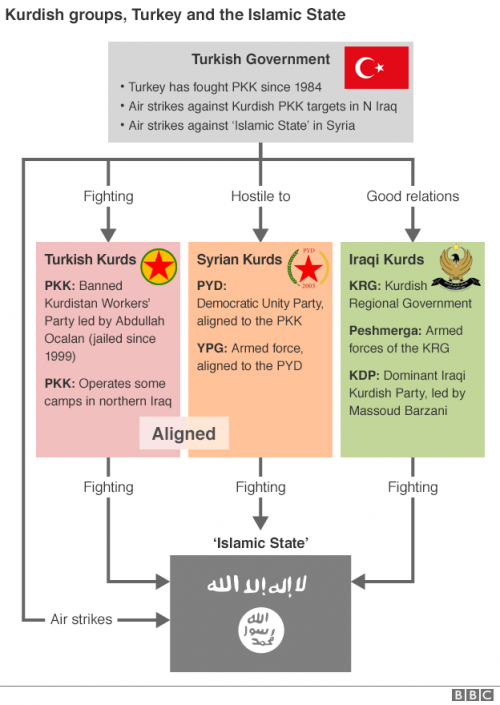 Turkey had been forced to form new alliances as a result. After the failed coup attempt in Turkey, the latter sees itself as a player within another triad: that of Russia, Iran, and Turkey. Turkey has normalized its good relationship with Israel, while ignoring the Palestinian issue, for the purpose of protecting its own interests. This relational triad has become a major concern to the United States and Saudi Arabia. Up to the present, it is not clear whether Turkey will remain a member of NATO because it cannot embrace Russia and the United States at the same time. Voices in the United States and Europe are calling for the removal of Turkey from NATO, but Turkey intends to protect its interests and the dominant Justice and Development Party (AKP) power base as it steps across all the red lines to keep the only Brotherhood government in the world in power. The establishment of ISIS in the region on June 2014 was actually a branch of Al Qaeda, and it changed all manner of disputes in the region. The war turned into a war between Shiite and Sunni factions and the Kurds played an important part as they became entangled in the war as well. 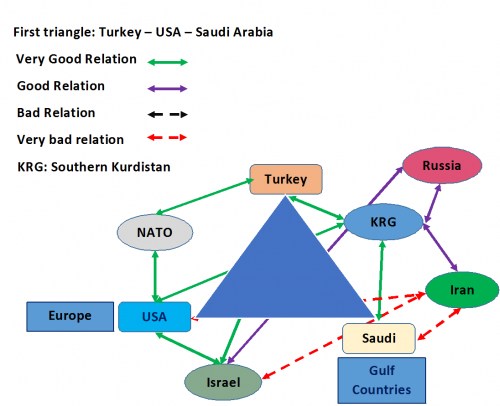 The Kurds in Iraq generally have good relation with the US, Europe, and Turkey. Interestingly, while the Kurds of Iraq have respectable relations with Iran, they have a bad relation with the central government in Baghdad. Under pressure from the United States the Kurds of Iraq have maintained decent military relations with Baghdad and this is for the purpose of fighting ISIS. Unfortunately, however, we have many political problems within the Kurdish political parties in Iraq, causing many to wonder what will be the future of relations between the Kurds of Iraq and Baghdad once the war against ISIS is over. What the Kurds are generally proud of is that its Peshmarga forces are united in the fight against ISIS in order to protect the borders of Kurdistan from her enemies. Since the 1980’s the Kurdistan Workers Party (PKK) has been united in its fight against the Turkish Government and all of its abuse of the Kurdish people of Turkey. The PKK has spent its full power supporting the Kurds of Syria in their fight for survival, and fighting ISIS in Iraq. 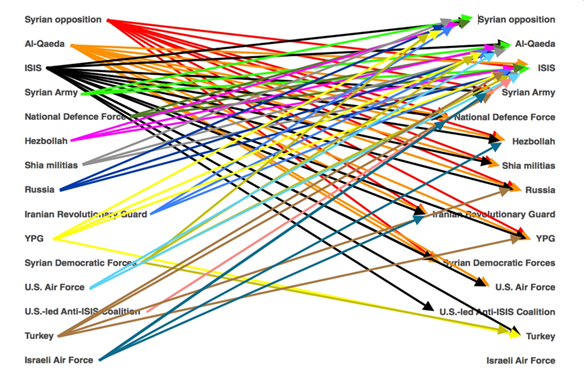 They also have a decent relationship with Iran and the Iraqi government. The Kurds of Syria’s People’s Protection Units (YPG) are united in their fight against ISIS as they are united in their cooperation and activities designed in coordination with the same Syrian opposition. The YPG have a civil relation with the Syrian government, but horrible relations with the Turkish government, because the latter regard them as an extension of the PKK. The US-back the alliance between the YPG and some Syrian Arabs called the Syrian Democratic Forces (SDF) in their fight against ISIS, and Turkey views this support as a major threat to its borders. The question has arisen as to what will happen to this support after the war against ISIS is over? It has not been clear up until now what the role and the rights of the Kurds in Syria will be once the ISIS-initiated crisis has concluded. The Kurds in Syria are not politically united, as they have different understandings and interpretations as to how best to rule their region. In the last few months the Kurds in Iran have begun an armed struggle against the Islamic Republic of Iran. A major problem of the Kurds of Iran is that they have not successfully formed alliances among themselves and are quite fractured. Hence, they work in factions and lack the unity to be maximally effective. Today the Kurdistan Democratic Party of Iran is leading the struggle against the Islamic Republic of Iran alone and other parties are merely standing on the sidelines watching. To be fair, however, the Azady Party (Freedom Party) is fighting side-by-side with the Peshmarga in Southern Kurdistan. If we look at the map of the Greater Kurdistan area, we see that for the first time in all of their individual histories, the Kurds are fighting at the same time in all parts of Kurdistan. Though they are separated from each other due to each’s relation with their corresponding central government occupying their regions, they are each fighting separate fights against those who oppose Kurdish rights and against those who oppress them. One might ask if, under these similar conditions, whether this is the right time to ask for, if not demand, independence. The fact is that, while the Kurds of the four regions have many differences in terms of the battles incumbent on them to fight, in order to protect their rights and God-given freedoms, all the enemies of the Kurds are united in their battle against the Kurds. But it should not be forgotten that the Kurds in all their regions are in agreement as to the necessity for each of them to win their battles against the regimes that oppress them. The Kurdish house should be united, where the interests of individual, economic, and political parties are not put above the rights of the Kurdish Nation. This point is a pillar of the other following points. Establish a military and unified political national strategy among all parts of Kurdistan. Unite the Peshmarga forces in each region. Forbid the fighting among the Kurds in all parts of Kurdistan. All meddlings in the affairs of regions external to Kurdistan should cease at once. The Kurds must put the interests of the Kurds above all others. The Kurds must do their best to implement democratic forms of government, involving human rights, a free economy, and freedom of law, while developing a Constitution where the rights of all the people of Kurdistan are equally protected by law. Achieving this goal should motivate the United States and Europe to support the referendum for an independent Southern Kurdistan and put pressure on the international community to recognize the newly created Kurdish state in Southern Kurdistan. The Kurdish leadership must finally come to the realization and recognition that, if and when the time arrives where the United States is forced to choose between the Kurds and Turkey, they will in a heartbeat choose Turkey. The United States and Turkey share a very strategic relationship, out of which United States is the major backer but in turn secures a huge geo-political influence, control and base in Central Asia. For the Kurds to be a major player in the region, they must gain the trust and respect of the United States and Europe. The Kurds must therefore work on the above points in order to become an independent regional power in their own right in the region.